Speaking at the AFI festival, Ridley Scott gave a very detailed description of what the opening of Blade Runner 2 will look like. It involves stew, a creepy tree, and Harrison Ford. Turn around and you see a massive tree, just dead, but the tree is being supported and kept alive by wires that are holding the tree up. It’s a bit like The Grapes of Wrath; there’s dust, and the tree is still standing. By that tree is a traditional, Grapes of Wrath-type white cottage with a porch. Behind it at a distance of two miles, in the twilight, is this massive combine harvester that’s fertilizing this ground. You’ve got 16 Klieg lights on the front, and this combine is four times the size of this cottage. And now a spinner [a flying car] comes flying in, creating dust. Of course, traditionally chased by a dog that barks. The doors open, a guy gets out and there you’ve got Rick Deckard. He walks in to the cottage, opens the door, smells stew, sits down and waits for the guy to pull up to the house to arrive. The guy’s seen him, so the guy pulls the combine behind the cottage and it towers three stories above it, and the man climbs down from a ladder – a big man. He steps onto the balcony and he goes to Harrison [Ford]’s side. The cottage actually [creaks]; this guy’s got to be 350 pounds. I’m not going to say anything else – you’ll have to go see the movie. 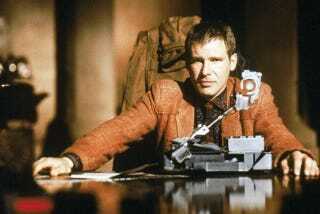 It sounds like Deckard has retired to the middle of nowhere following Blade Runner. Everyone always leaves for farms. Either the large man is going to be a threat, a random expository moment, or give Rick the traditional “call to duty” speech.